Announcement of the 2018 Fleurons du Québec rankings - Rosemère Still on Top with “5 Fleurons”! ROSEMÈRE, November 16, 2018– The Town of Rosemère is still a “5 Fleurons” community! 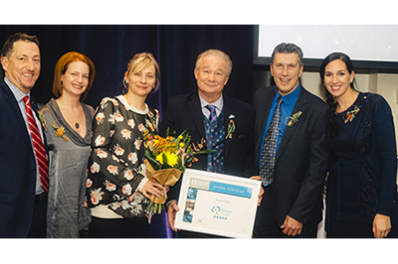 The good news was announced last night, November15,2018, at a gala evening where the 2018 horticultural classification rankings of municipalities across Quebec were unveiled. The Corporation des Fleurons emphasized Rosemère’s multiple efforts to sustainably beautify its living environment and enhance residents’ quality of life. The Town rose to the highest ranking of “5Fleurons” in 2015 and has maintained this classification ever since. The Fleurons rankings are valid for a three-year period and come with a professional assessment report indicating suggested areas for improvement. The Corporation’s classification officials visit 60% of the territory of each participating community and evaluate all sites in public view.